ABINGTON, Mass. —An Abington mother charged with pepper-spraying her children’s babysitter and fleeing with the children faced charges of parental kidnapping Friday. 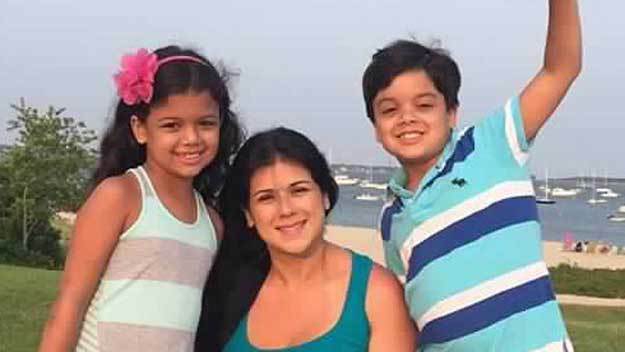 Police say 33-year-old Bruna Gomes was arrested on Cape Cod Thursday several hours after she took the children from the Abington apartment of her children’s father. Bruna Gomes, 33, was arrested Thursday after she forced her way into an apartment and kidnapped her two children, prompting officials to issue an Amber Alert, police said. “I don’t know why she did this because we are going to court about the kids,” said Bruno Coelho, the children’s father. After Gomes allegedly assaulted the babysitter and fled with the children, Nathalia Coelho, 7, and Nathan Coelho, 8, an Amber Alert was issued. Gomes was arrested at a Yarmouth motel hours later after a teen said he noticed the Amber Alert on his cellphone and spotted a vehicle matching the description. Andrea Silva, a friend of Gomes, said the couple is engaged in a bitter custody battle and feared the children would be sent back to Brazil, their native country. “I feel for her. She did something without thinking. She’s a nice person,” said Silva. The children were reunited with their father Thursday night. Gomes was ordered held on $25,000 bail and to surrender her passport. This entry was posted in Uncategorized and tagged Abduction Abington, Andrea Silva, Bruna Gomes, Bruno Coelho, Nathalia Coelho, Nathan Coelho, Parental Abduction Brazil, Parental.Kidnapping. Bookmark the permalink.